Sprout the seal found on the log booms in Prince Rupert and was sent Vancouver Aquarium's Marine Mammal Rescue Centre for three months. Before passengers received their luggage at the Prince Rupert terminal, a staff member brought in a large crate occupied by a very small seal pup. Sprout, a harbour seal, arrived on Digby Island aboard the Air Canada flight Wednesday afternoon, after spending the past three and a half months in rehabilitation at the Vancouver Aquarium’s Marine Mammal Rescue Centre. Late May, Rupert Coast Sort Ltd. employees spotted the seal pup on the log booms in the harbour. Not all seal pups left alone need help, stressed Caitlin Birdsall, the coordinator of the North Coast Initiative for Vancouver Aquarium. The mother’s sometimes leave their pups while they go forage for food. In Sprout’s case, she needed help. Birdsall believes the pup may have been born premature because she still had her lanugo, or fluffy newborn fur, which is typically shed in utero. The pup also didn’t seem to be doing well. “They did the right thing. 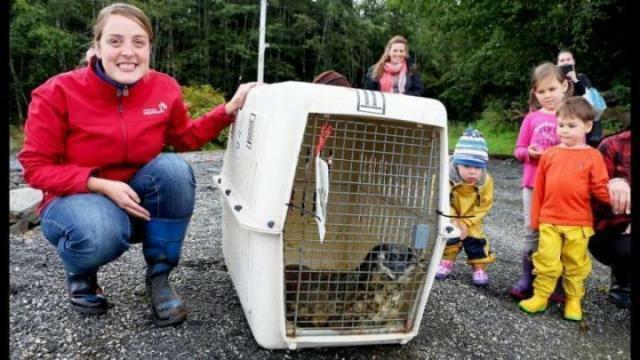 They called the rescue centre where they assessed the situation to make sure we’re helping seals that need help,” Birdsall said, who explained how Sprout was found while she waited for the seal pup to arrive at the airport. After getting the approval from the rescue centre, Rupert Coast Sort picked Sprout up from the log booms and took her to the Pacific Coast Veterinary Hospital for the night. She was on the morning flight to Vancouver. On May 29, the marine mammal rescue centre welcomed the pup. She was only 6.76kg when she arrived — and by mid-September she was more than 20kg. From sea otters to dolphins, there are many varieties of animals that come to the rescue centre, but the most common patients are seal pups. Birdsall said that centre sometimes receives more than 100 seal pups in one year and they have a really good success rate at reintroducing them into the wild. When Sprout came to the rescue centre she was underweight and malnourished. Lindsaye Akhurst, the manager at the centre, said they fed her a high fat formula through a tube five times a day to help the pup gain weight. Sprout, who was named by one of the supporters of the rescue centre, was also dehydrated. She was given fluids twice a day until her condition improved. “Once she was able to eat fish on her own we gave her more and put her in a larger pool with more seals. She was given fish three times a day. She had the ability to swim around with other seals and lounge out in the sun,” Akhurst said. Three and a half months later the rescue centre gave her a physical exam, did some blood work and found she had a full bill of health to be re-released in northern waters. Typically, the centre releases animals back to the area they were found. Before she flew back home, complements of Air Canada, the rescue centre tagged her left flipper and micro-chipped her just in case she’s ever found again. Birdsall welcomed the young seal pup at the airport and squeezed the stinky crate in her car. Luckily, the drive to beach front on Digby Island wasn’t too far. A small audience was there to witness the seal emerge from its cage and flop down to the water. Sprout, however, timidly reacquainted herself with the North Coast shores and spent at least 30 minutes debating on whether or not to seek land or dive in the water. “Some seals are a little bit slower and some dive in and we don’t see them again. Most of the time they get into the water and they’re exploring their environment. Sprout has been in a rehab center for the first two months of her life. She probably doesn’t remember when she was in the wild,” Akhurst said. At last, Sprout worked herself up to moving further away from dry land and took one last dive.